6140.9 : Anthropomorphic Figurine made of parian marble of 'Louros' type. indicate import or production of olive oil. All items in their use as grave offerings acquire symbolic dimension. Figurines, however, have primarily votive or ritual character. 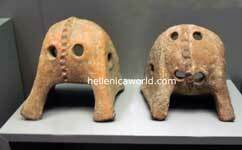 6113 : Clay hemispherical vessels with holes and decoration of plastic rope-like bands.